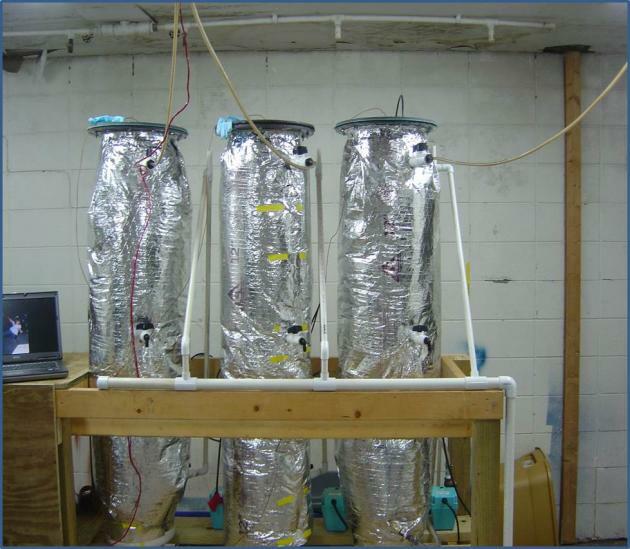 Ninety liter (90 L) anaerobic digesters (anaerobic filters) were constructed from PVC pipe. The digesters were filled with lava rock. A thermocouple is placed in the center of each digester to be used in controlling temperature. Each digester is controlled by a datalogger by reading temperature and turning on or off pumps to circulate water around digester maintaining temperature at 35 oC. Biogas is collected in a tipping bucket and recorded on datalogger. Consumers demand high quality fruits and vegetables. As a result, packing sheds around the country cull or remove bad fruits and vegetables prior to packing then in boxes for shipment to stores. The culling process produces millions of pounds of waste fruits and vegetables annually. This culled fruit or vegetable then has to be disposed of in some form or fashion. Therefore, a project was designed to investigate the feasibility of using culled onions in conjunction with dairy waste to produce methane gas. 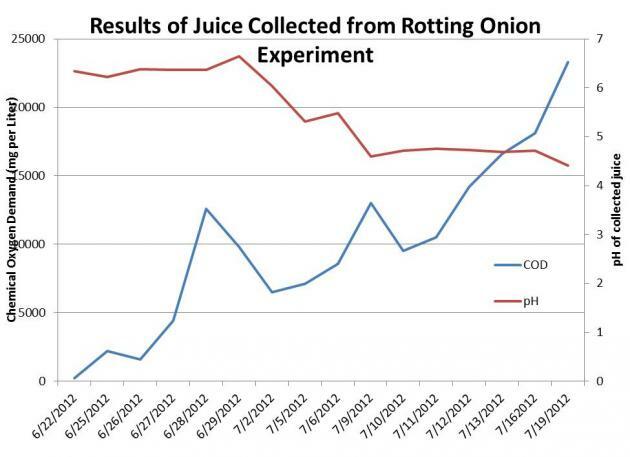 The experiment used 90 liter downflow anaerobic filters to process a 50/50 mix of onion juice and dairy waste. Results from this study indicate the co-digestion of culled onions and dairy waste provides a good way to dispose of the waste onions while at the same time producing a renewable energy that can potentially be used in the packing shed where the onions are separated. The 50/50 blend of onion waste and dairy waste has consistently returned an average of 15 liters of biogas (70-75% methane) per 3 liters of mixed waste entering the digesters with a cleaning efficiency over 85%. Why Look at Food Waste for Co-Digestion with Manure? Culled onions or any fruit and vegetable has to be disposed. Some of these are fed to animals, but some are thrown on fields and potentially tilled into the soil. However, if they are piled and allowed to decay in place the liquid produced during the decaying process can have a high chemical oxygen demand (COD). If this liquid is allowed to run into waterbodies they could be polluted or if allowed to infiltrate could be transferred to a waterbody through underground movement. Therefore, this project investigated the characteristic of liquid produced from decaying onions as well as the feasibility of using waste onions along with dairy waste to produce methane gas in anaerobic digesters. If feasible, the culled onions (or other fruits and vegetables) could be used as a source of energy verses a disposal issue. The experiment had two parts. The first part placed whole onions in a steel tank on a 2 foot bed of sand where the onions could naturally decay. The liquid along with any rainwater was collected in portions and tested for its pH and Chemical Oxygen Demand. Additionally, waste onions were juiced and mixed with dairy wastewater in a 50/50 mixture and used as feedstock for an anerobic filter digester. Temperature was controlled in the mesophilic range and biogas was measured. As expected, the decaying onions release a liquid that over time increases the COD profile of the liquid draining from the decaying pile. It is expected that if onions were continually piled on the same spot, the COD and pH of the liquid would equalized at a COD value measured to be approximately 80 g/L and the pH would drop to approximately 3.5 (these numbers based on some previous studies and bench scale observations). The data also suggest that, and as would be expected, onions decay faster in the summer months as opposed to winter months in Georgia. It was also found that a 50/50 mix of onion waste and dairy wastewater fed to a pilot scale mesophilic anaerobic filter fed at 3 liters per day and a retention time of 7 days will produce approximately 15 liters of biogas daily with a methane composition of 70-75%. The treatment level of the influent was also found to average greater than 85%. The Chemical Oxygen Demand (COD) of liquid collected from the bottom of a tank full of decaying onions increases over time. Likewise, the pH of the liquid decreases. If these onions are disposed of in a wet area or area adjacent to a waterbody, the stream would be affected by the high COD and low pH liquid. Biogas production from the mixed 50/50 onion/dairy waste fed at a rate of 3 liters per day. The methane composition of the biogas ranged from 70-75%. Treatment efficiencies of the waste, based on COD reduction, averaged greater than 85% (over 20 g L-1 influent to less than 2 gL-1 in effluent). Future plans will be continue the investigation of using waste onions (and other fruit and vegetables) as a feedstock for anaerobic digesters. This feedstock, which is very available in onion growing regions seasonally, liquid from the onions can be stored over time (as observed in other research project) to provide a year round feedstock for the production of methane gas. As we now know that the decaying onions release a liquid that has a high COD, using the onions for production of energy may reduce potential problems with water pollution as well as provide growers with additional income streams. Plans will be to continue this work and look at optimizing the feed rate and mix ratios. A few articles have been written about the project, research papers will be written in the near future.